It’s not often you see an older coin with such a significant error and one in such good condition as this. Struck in 1944 when Australia lacked the industrial capacity to do so because of the war the above coin was minted at the San Francisco Mint in the United States. At that time America was minting our silver coins florins, shillings, sixpences and threepenny pieces. Likely removed from a bag or roll before entering circulation the florin depicted has been struck on a shilling planchet of 5.65g. Now that seems like an easy error to occur and has been easy to identify, a shilling blank contaminated the hopper of blanks waiting to be struck as florins and this underweight blank breezed through the minting process and out the other side without incident. This coin now proudly resides in a PCGS slab graded MS63 or our opinion grades it to choice uncirculated in the Australian adjectival grading scale. Such a rare error and the first we’ve seen but digging deeper in Australia’s public auction house history we found this exact coin appearing in the July 1998 Noble Numismatics Sale 58 Lot 2074 realising $500 (+10% BP) on a $150 estimate. It was advertised as nearly Uncirculated and had not yet been put in the PCGS slab. That was certainly a time when errors weren’t as popular as they are today and the price shows that but an astute collector saw the rarity and value in this coin and kept in safe place for the last 70 odd years. Today this coin would sell for quite a few thousand dollars. We’ve seen other errors at the overseas mints striking coins for Australia. Again in 1944 a planchet for one of their own nickel coins escaped into the hopper and was struck as an Aussie shilling. Also a 1942s shilling was struck on a sixpence planchet at the same mint. 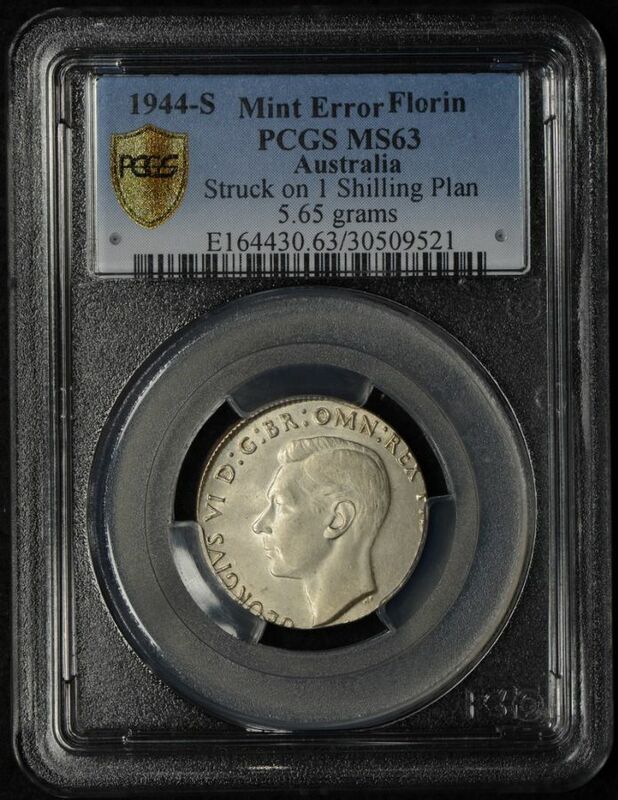 Interestingly Bill Snyder of worlderrors.com published a chart in Mint Error News Magazine titled “A Study of World Mis-Struck Coins” where he undertook a study on Australian striking errors between 1944 to 1995 and found only one example of the 1944s florin on a shilling planchet. So how do we know this coin is genuine and the fantastical story of it’s minting is true? 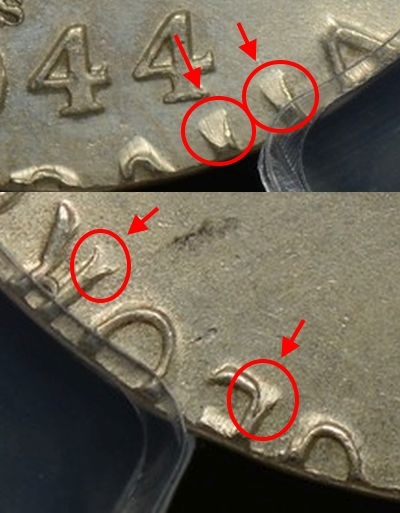 It could well be that someone has ground down the edges in their workshop and manufactured this error that would be termed PMD (post mint damage). The mere fact that the coin has been slabbed by PCGS is the first surety of it’s authenticity. A coin graded by PCGS has been looked at closely with great skill and care before their grade is assigned to the coin and the coin placed in the slab. Viewing the closeup image of the coin confirms the features we see on the coin that point toward it being struck on an underweight planchet. The size of a florin is 28.5mm and the shilling planchet would be significantly smaller at 23.5mm. This undersize planchet would have been fed into the press without issue and was struck with the die for the Australia florin, the Coat of Arms reverse. It’s the detail in this strike that holds the key to this being a genuine error. When a planchet is too small for the collar, metal will flow outward and this is exactly what we see here in the legends of this coin. The letters have fishtailed bases shown with red circles and the arrows indicate the direction of metal flow. This would certainly not be the case if the coin had been somehow altered after it was struck in the back shed or alike. Showcasing a truly rare Australian pre-decimal error coin has been a pleasure and this is certainly a coin that any error collector would prize in their collection.